This past holiday weekend I was with family for the holiday's and my father in-law had a terrible case of Trigger Finger. I started to tell him how I have helped patients with this condition without surgery using a combination of non-surgical techniques like the Graston technique, Cold laser therapy and Kinesio taping in our NYC physical therapy and Chiropractic practice. Below I have posted some information about Trigger finger. A trigger finger occurs when the motion of the tendon that opens and closes the finger is limited, causing the finger to lock or catch as the finger is extended. Tendons that control the movements of the fingers and thumb slide through a snug tunnel of tissue created by a series of pulleys that keeps the tendon in place. The tendon can become irritated as it slips through the tunnel. As it becomes more and more irritated, the tendon may thicken, making its passage through the tunnel more difficult. The tissues that hold the tendon in place may thicken, causing the opening of the tunnel to become smaller. As a result, the tendon becomes momentarily stuck at the mouth of the tunnel as the finger is extended. A pop may be felt as the tendon slips past the tight area. This why pain and catching may be felt as the finger is moved. The cause is not always known. Trigger fingers are more common in women than men. They occur most frequently in people who are between the ages of 40 and 60 years of age. Trigger fingers are more common in people with certain medical problems, such as diabetes and rheumatoid arthritis.I often find that patient complains of previous wrist,elbow and hand pains. Symptoms of trigger finger usually start without any injury. Symptoms may include the presence of a small lump, pain in the palm, swelling, and a catching or popping sensation in the finger or thumb joints. Stiffness and catching tend to be worse after inactivity, such as when you wake in the morning. Often, finger movement will loosen up with activity. Sometimes, when the tendon breaks free, it may feel like the finger joint is dislocating. In severe cases, the finger cannot be straightened, even with help. Sometimes, one or more fingers are be involved. Patients with diabetes can have several fingers involved, for example. If symptoms are mild, resting the finger may be enough to resolve the problem. Over-the-counter pain medications can be used to relieve the pain. Splints are sometimes used to rest the finger. A physician may choose to inject a corticosteroid. Sometimes, the improvement is temporary and more than one injection may be needed. Injections are less likely to provide permanent relief when the triggering has been present for a long time, or if when there is an associated medical problem like diabetes. If these treatments do not improve surgery is usually recommended. Small right arrow pointing to: This article has been cited by other articles in PMC. To detail the progress of a patient with unresolved symptoms of Trigger thumb who underwent a treatment plan featuring Active Release Technique (ART) and Graston Technique. The most important feature is painful snapping or restriction of movement, most notably in actively extending or flexing the digit. The cause of this flexor tendinopathy is believed to be multi-factorial including anatomical variations of the pulley system and biomechanical etiologies such as exposure to shear forces and unaccustomed activity. Conventional treatment aims at decreasing inflammation through corticosteroid injection or surgically removing imposing tissue. The conservative treatment approach utilized in this case involved Active Release Technique (ART®) and Graston Technique (GT). An activity specific rehabilitation protocol was employed to re-establish thumb extensor strength and ice was used to control pain and any residual inflammation. Outcome measures included subjective pain ratings with range of motion and motion palpation of the first right phalangeal joint. Objective measures were made by assessing range of motion. A patient with trigger thumb appeared to be relieved of his pain and disability after a treatment plan of GT and ART. 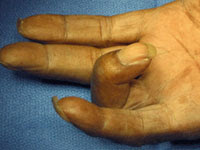 Keywords: AA1 pulley, Active Release Technique, Graston Technique, flexor tendinopathy, trigger finger, trigger thumb, metacarpophalangeal joints. I am attended the first series of the ART seminars this upcoming weekend, this will be a additional tool I use to treat this and other conditions.